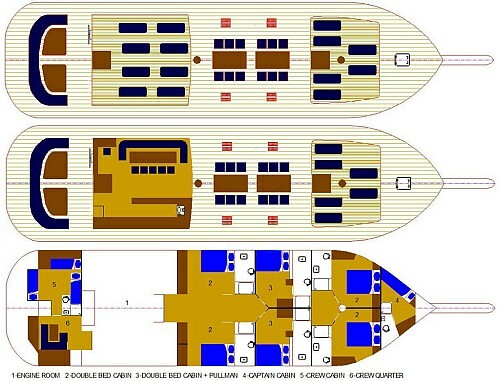 6 double bed cabins, 2 King Cabins with separate entrance, 4 double bed cabins entering down from salon. Marko was the moving spirit of the Mrcic family to buy beautiful gulet Libra. The family is in various types of service industry over a 30 years; they have owned restaurants, clubs, and they still own store, excursion boat and luxury vacation villa. As Marko has always been devoted to sea, he has been skippering on their family boat and in bareboat charter. When Marko heard that Libra is for sale, he was sure that they need to get her. Experienced sailor, in love with the Adriatic coast, completely service and client orientated, Marko is an exemplary captain/owner. Marko speaks English, has detailed knowledge of the area, dynamic and welcoming he will suggest your clients best ideas, activities and programs. When negotiating on purchase of Libra new owners insisted to keep Bosko on board. 2014 will be his second season on board SY Libra. Bosko's formal training was 4 years at Culinary school in Split, to be proceeded with 11 years of experience in the restaurant of the oldest hotel in town Split, which is traditionally the most appreciated gathering place of various eminent social clubs of Split. After long and outstanding career there, Bosko has decided to become chef on board of charter yacht as he wanted opportunity to showcase his full potential, skill and love of culinary art to smaller group of clients on an intimate level and personal approach. Bosko's inspiration comes from locally produced, seasonal and fresh ingredients. Another detail was important to Bosko when he chose Libra for his playground: Libra's galley is opened, placed in salon which provides easy communication with guests, specially with those interested to get some of Bosko's cooking tips, secrets of the trade, recipes or simply to watch him create his magic. Branka graduated Management of small enterprises at University of Split, fluent in English, has experience in hospitality industry and in crewed yacht charter. Branka delights in making the yacht's interior warm and welcoming. Branka's intuitive sense of guests needs made her perfect choice for hostess on board of Libra. Her calm, cheerful personality, professional and detailed approach to every task that she keeps delivering with a smile and lighthearted. Nikola studied maritime management, speaks English. Also engaged in family business from early ages, Nikola fully understands importance of being always on disposal, team player and all-arounder. Nikola in his spare time enjoys a wide array of outdoor activities, especially water sports. That has made him an expert of destination activities just like his brother capt. Marko is.